AnyMP4 iPad Transfer for Mac is capable of transferring software for iPad users. This program can not only help users export iPad movie, music, photo, etc. to Mac for backup, but also import local videos, music and images from Mac to iPad. Besides, it allows users to convert any DVD and video files to iPad compatible video formats on Mac. Thus, users can fully enjoy them on their iPad. Apart from that it supports any version Apple devices such as 5S/5C, iPad Air, iPod Nano and even the latest iOS 7. AnyMP4 iPad Transfer for Mac enables users to transfer iPad files like music, movie, pictures, Camera Roll, etc. to Mac. Also, it allows users import local audio, video and image files to iPad as your proposal. This iPad Transfer for Mac can also convert all popular video files and DVD to iPad compatible video and audio formats. So users can enjoy the most popular videos and the latest DVD movies on iPad freely. This software provides you with the &quot;My Cache&quot; feature, so if you need to use the iPad while converting DVD/video to iPad, it can help you store the output iPad files in My Cache first without connecting iPad to Mac. And then you can transfer the files to iPad anytime. 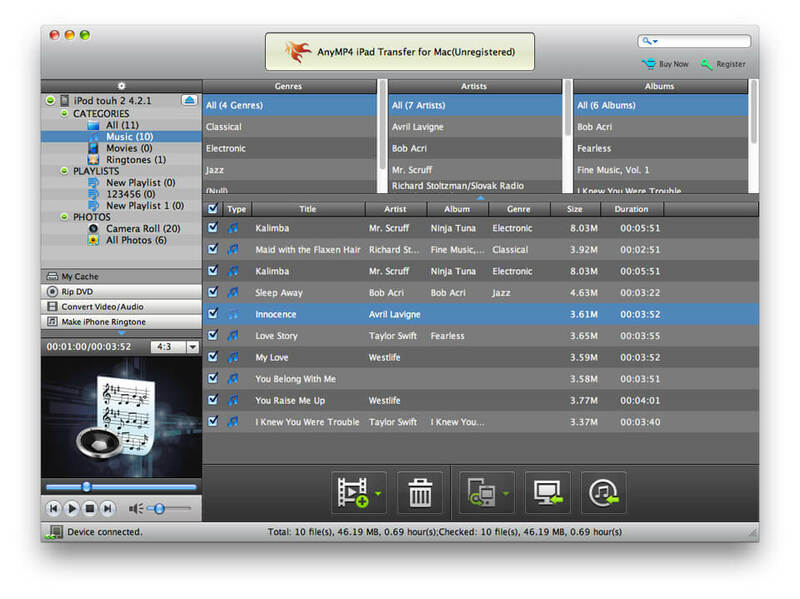 With this amazing software, users can preview the video, audio, photo file effect with the built-in player. Also it has the function of detecting the device automatically. Once you connect your iPad device to the computer, this iPad Transfer for Mac could detect the device automatically.